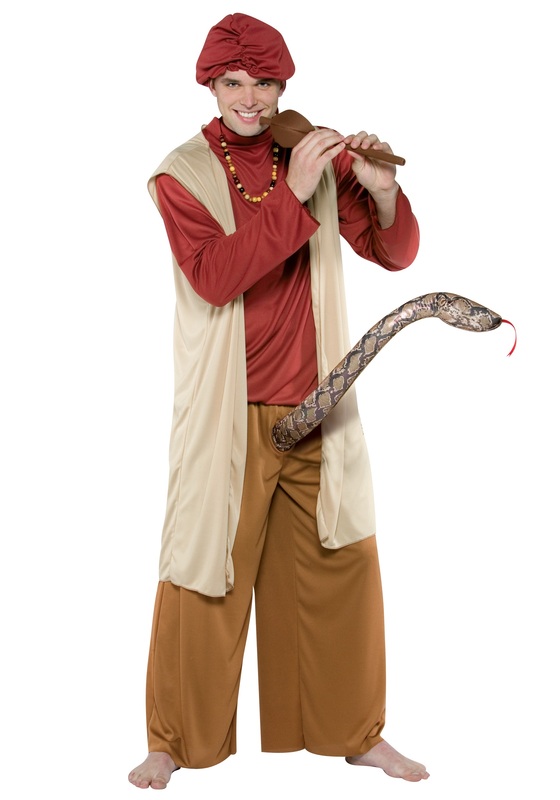 This Snake Charmer Mens Costume is full of double meaning. It includes a maroon long sleeve polyester tunic with an attached tan vest. A Velcro™ dot in the back makes for a comfortable fit. The brown polyester pants have an elastic waist and an opening in the crotch for the included plush stuffed snake. The snake is brown, tan and black and has a red ribbon tongue. A fishing line is attached to the front of the snake, which connects to the toy flute. The fake flute is covered in brown cloth and allows you to control the movement of the snake. A colorful bead necklace fits around your neck and the included hat finishes off the look. The hat matches the tunic and has an elastic band around the edge with mesh netting inside. Some ladies will be tempted!